The world’s top “geek couture” fashion event, The Her Universe Fashion Show, is celebrating its 5th anniversary this year by returning to San Diego Comic-Con with its biggest and best show yet. Host, actress, author of “It’s Your Universe” and Her Universe Founder, Ashley Eckstein, will be debuting a very special jaw-dropping gown created by 2013 fashion show winner, Andrew MacLaine. The 5th annual Her Universe Fashion Show will take place on Thursday, July 19th, 6pm, at the Manchester Grand Hyatt Hotel in San Diego. Doors open to the public at 5:15pm. Presented by Her Universe, Hot Topic and Loungefly in partnership with BoxLunch, Cartoon Network, SINGER Sewing Company and Zenni Optical this year’s milestone event brings together an all new group of 24 aspiring designers who will present their original “geek couture” designs on the runway. Three winners will be awarded the opportunity to design a fashion collection with Her Universe and Loungefly for leading pop-culture retailer Hot Topic – a judges’ winner, audience choice winner and, for the first time, a SINGER Sewing Company winner chosen for excellent sewing and construction. Past year’s winners have created designs for some of Hot Topic’s most popular and best-selling collections. Cartoon Network will be joining The Her Universe Fashion Show this year with a first-ever Junior Designer Showcase – a competition for aspiring designers between ages six to seventeen. The four winners of the Junior Designer Contest will be announced and presented with the opportunity to design an apparel piece inspired by The Powerpuff Girls with Her Universe for the pop-culture and gifting retailer, BoxLunch. Cartoon Network will also give fans in the audience a chance to show off their individual style and walk the runway. Behind the scenes coverage will be provided to fans this year thanks to our special content sponsor, Zenni eyewear. Leading tech expert, geek fashion influencer and eyewear connoisseur, Katie Linendoll, will be joining Ashley Eckstein as a special correspondent, bringing fans an additional point of view called “Eyes on the Runway” provided by Zenni. Guest judges joining the Her Universe 2018 Fashion Show panel will be Cindy Levitt, Senior Vice President of Licensing for Hot Topic, Todd Keller, Merchandising Manager for Loungefly, Joanna Fogt-Sohn, Senior Creative Director for Licensing and Merchandising at Cartoon Network, Olivia Mears, SINGER Sewing Ambassador, who creates wearable art using unconventional materials and is known for her “food fashion,” Jane Francisco, Editor-In-Chief of Good Housekeeping and 2017 Her Universe Fashion Show winners Rose Ivy, Grace Duval and Lindsay Orndorff . Her Universe will be debuting new fangirl fashion designs at this year’s show and fan favorite DJ Amanda Jones will once again be returning to provide music for the event. Espionage Cosmetics is also returning as the beauty sponsor for the fashion show. Her Universe shines the spotlight on DC fangirls and officially announce the first-ever DC activewear collection. The announcement, in partnership with Warner Bros. Consumer Products, and with Kohl’s marks the first time ever that Her Universe has designed a collection inspired by the world’s most iconic DC Super Heroes—Wonder Woman, Batman, and Superman. Her Universe has created a fashion forward line available exclusively in Kohl’s stores nationwide and on Kohls.com April 3. Her Universe has teamed up with Kohl’s to create a fashion forward line available exclusively in Kohl’s stores nationwide and on Kohls.com April 3rd, which includes sports bras, tank tops, tees, jackets, shorts and leggings available in juniors and plus sizes. Price point of the collection is $24 to $55. The Wonder Woman collection is landing in stores in May in celebration of the new Wonder Woman movie opening June 2. Eckstein has also created three 5-minute quick and easy workout videos inspired by each character to train like Wonder Woman, Batman and Superman. No experience or equipment necessary. Set phasers to stun! In celebration of Star Trek’s 50th anniversary, Her Universe has joined forces with ThinkGeek, the premier retailer for the global geek community, to launch an all-new stunning Star Trek fashion collection featuring dresses, jackets, blazers, skirts, fashion tees, scarves, brooches, and more. Just in time for the holidays, this 50th Anniversary collection has something to energize every Star Trek fan’s wardrobe. Under license by CBS Consumer Products, the retro-inspired designs feature the Star Trek delta shield, Trek uniform-inspired skirts, stylish Starfleet dresses, bomber jackets, and even a Tribble-infused faux fur coat. Customers who purchase $85+ from the collection will receive a set of four collectible pins from either Star Trek: The Original Series or Star Trek: The Next Generation. Customers who purchase $150+ from the collection will receive a second pin set – collect them both! In honor of the 50th anniversary and the launch of the Star Trek collection, ThinkGeek is giving away a $300 gift card for one lucky fan that’s sure to transport their wardrobe into the future. Enter for a chance to win. Featured here on Her Universe Founder Ashley Eckstein, the Star Trek Bardot party Dress features a scalloped neckline, princess seams, and a hidden side zipper. Lined in red, the voluminous circle skirt can be worn without extra underneath for length or fluffed up with a petticoat for a truly striking entrance to your next party. The Star Trek Tribble Faux Fur Coat is hip-length and has two front pockets, an oversized hood, and a drawstring closure at the neck featuring dangling tribble pompoms. Lined in a polyester tribble print for additional cuteness (as if it needed it). Choose from Blue/Science/Commander, Gold/Operations/Lieutenant Commander or Red/Command/Captain. The black mesh shoulders lead to a sweetheart-shape in the division color fabric, which is a comfortable soft jersey. This Star Trek blazer features a notched lapel, jetted faux pockets, and princess seams in the front. The lining print is TOS insignia, and it peeks out if you roll the cuffs. The Star Trek Andie Boxy Tee is created from a TOS insignia print fabric and features a scalloped bottom, round neck, and a black translucent back. When worn, it looks like an abstract pattern to folks far away or those not in-the-know. Part of the ThinkGeek Star Trek Collection by Her Universe, this 13” X 40” infinity scarf is ready to wrap around your neck and protect you from the Vulcan nerve pinch. The adorable Star Trek TOS Uniform Skirt comes in Blue/Sciences/Commander, Gold/Command/Captain, and Red/Engineering/Lieutenant. With its circle skirt and the Peter Pan collar, this Star Trek Ships Mae Dress feels very mid-century. Even the print itself has a great retro atomic vibe with starbursts and offset coloration. But that mesh top makes it modern. Well, that and the spaceships all over it. It’s a new week and we’ve got lots of interviews, reviews, and more coming up! Plus, there’s Doctor Strange opening this coming weekend! While you await all of that, here’s some comic news and reviews from around the web in our morning roundup. CBR – Correction: Fandom is Broken – Agree? Disagree? Vancouver Sun – Police recover stolen comic books including the rare Fantastic Four: Issue No. 1 – Good to hear these have been recovered. The Washington Post – Online bullying may have cost the comic-book industry its next great female voice – And someone who could bring in prose readers. France 24 – Paris attacks survivor recounts night of horror in ‘My Bataclan’ graphic novel – Didn’t know about this one at all. Could be an interesting read. CBR – 15 Stereotype-Inspired Comic Book Characters And How They Were “Fixed” – Some interesting comic history. ICv2 – Hot Topic Acquires Her Universe – Not sure if this is a good thing or not. Fusion – How Doctor Strange went from being a racist Asian caricature to a magical white savior – Some good comic history. Her Universe is returning to San Diego Comic-Con International this year in a big way! 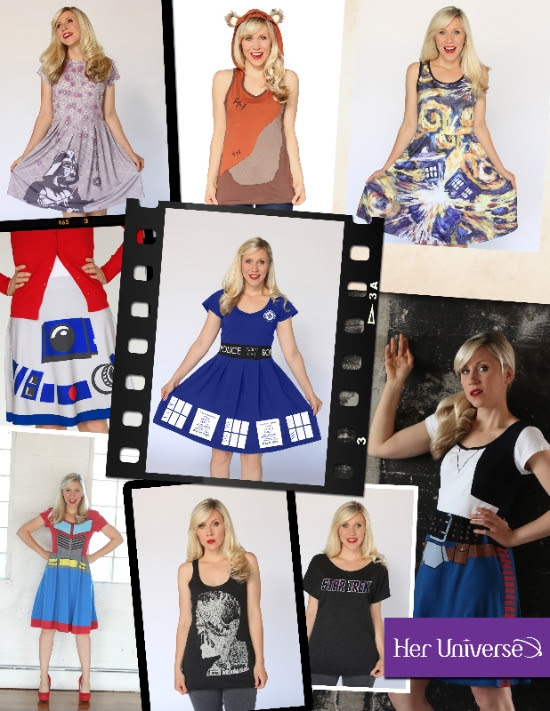 Actress and Her Universe Founder, Ashley Eckstein, revealed that Her Universe will debut several new designs and will offer dresses, cardigans, fashion tops and much more from Star Wars, Marvel, Doctor Who, Star Trek, The Walking Dead and Transformers. In addition, the Star Wars by Her Universe R2-D2 My Hero Jewelry Collection that is designed at the Sparkle Factory and made in the USA will make its convention debut. And, just in time for the film’s August 1st debut, every purchase made at the Her Universe booth will receive a FREE Marvel’s Guardians of the Galaxy slap bracelet. As with previous years, the Her Universe booth will be located in the Lucasfilm Pavilion, #2913-E. These new releases in the Marvel by Her Universe apparel line will be available at the Her Universe booth (2913-E) at this year’s San Diego Comic-Con. A selection of new Her Universe fashions from Star Wars, Doctor Who, Transformers, The Walking Dead and Star Trek available at the Her Universe booth (2913-E) at this year’s San Diego Comic-Con. The Star Wars by Her Universe R2-D2 My Hero Jewelry Collection that is designed at the Sparkle Factory and made in the USA will be available at the Her Universe booth (2913-E) at this year’s San Diego Comic-Con. 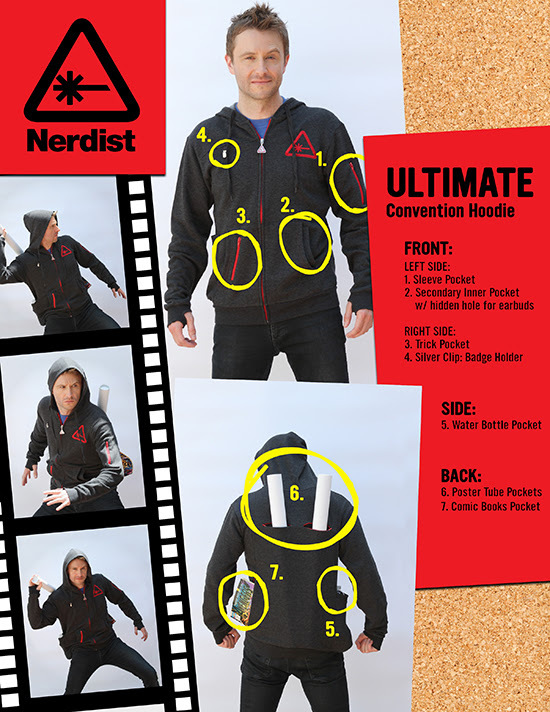 The new Nerdist Ultimate Convention Hoodie, modeled here by Nerdist Founder Chris Hardwick, is also available for men and women at the Her Universe booth (2913-E) at this year’s San Diego Comic-Con. Star Wars fans are preparing for yet another epic journey this year as the 2nd annual Course of the Force lightsaber relay prepares for its launch July 9th through the 16th. This time, Her Universe, a leader in female genre merchandise, and founded by actress and voice of Ahsoka Tano on Star Wars: The Clone Wars, Ashley Eckstein, will be the apparel merchandise partner for the event. Her Universe will be selling this brand new merchandise for both men and women at the COTF “conival” events in San Francisco, Santa Monica, Huntington Beach and Oceanside Pier as well as at the Her Universe booth at San Diego Comic-Con 2013 where the relay concludes. $5.00 from the sale of each shirt and $10.00 from the sale of each hoodie will go to the Make-A-Wish Foundation. In addition to providing the apparel for this year’s Course of the Force, Eckstein is also returning, for the 2nd year in a row, as co-host with The Nerdist’s Chris Hardwick and other talent for the exclusive coverage of the relay. You can still sign up for Course of the Force, the lightsaber relay from Skywalker Ranch to Comic-Con International in San Diego July 9-16, 2013 benefiting the Make-a-Wish Foundation, by clicking here. Her Universe has teamed-up with BBC Worldwide launching a Doctor Who Fangirl Fashion Collection. Launching July 11, the Doctor Who apparel and accessories from the Her Universe collection will be available in the U.S. and Canada at both www.heruniverseshop.com and BBCAmericashop.com and through national retail outlets such as Hot Topic. 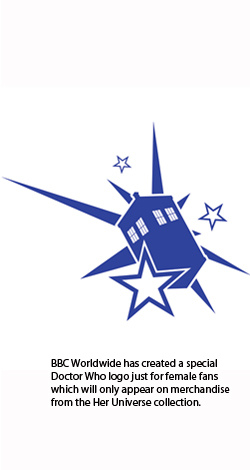 Throughout 2012, the Doctor Who merchandise will also be available at select conventions including San Diego Comic Con. BBC Worldwide has also created a special Doctor Who logo just for female fans which will only appear on Her Universe merchandise. You can see the logo to the left and some of the shirts below.